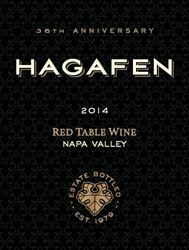 Hagafen Cellars, producers of Estate Bottled wine from certified organic Cabernet Sauvignon, Cabernet Franc, Syrah and White Riesling grapes. We also produce wines from outside growers in several sub appellations. Prix Reserve Estate Bottled wines are also produced in select vintages. Don Ernesto Vineyards produces several light hearted and fun varietals. Our casual, social and lively tasting room welcomes you in with warmth and old school Napa charm. Come taste our more than 20 wines, including our flagship Hagafen, our reserve Prix and our irreverent Don Ernesto. We look forward to seeing you soon! To join the wine club, visit hagafen.com or call 707-252-0781. Hagafen Cellars is certified under the Napa Green Winery Program by the Napa County Department of Environmental Management (DEM) and the Association of Bay Area Government’s (ABAG) Green Business Program and completed all the regulatory components needed for environmental sustainability. These components included developing water and energy conservation methods, preventing pollution, and reducing solid waste. In addition to developing sustainable winery practices, this program is set to become the standard for the state of California. Hagafen Cellars is certified under the Napa Green Certified Land Program. Hagafen Cellars has created and implemented a customized farm plan with measured results that addressed all aspects of its property, vineyard land as well as non-farmed land, including practicing soil conservation, water conservation, stable drainage, riparian corridor enhancement, fisheries and wildlife habitat enhancement and long-term improvement and sustainability.